The Heaphy had been on my bucket list for a while. Last winter we had it all organised, only for a storm to sweep through and scupper our plans. But a fortnight ago the stars aligned and off we pedaled, leaving Brown Hut and Golden Bay at our backs. 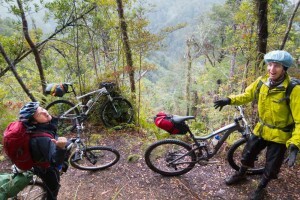 Beautiful beech and flitting fantails surrounded us as we made a leisurely 17km ascent to the ride’s 914m high point. Pausing for some sugary fuel, I was feeling a little nonplussed. 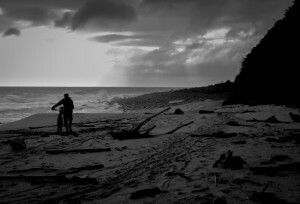 I’d heard the Heaphy was a ride of great diversity but so far I would describe it as pleasant yet slightly monotonous. However, as we pointed our bikes downhill and let the speed build, the forest suddenly disappeared. The landscape opened up, a palatial Perry Saddle Hut loomed and the wide expanse of Gouland Downs shone in the distance. What a sight! 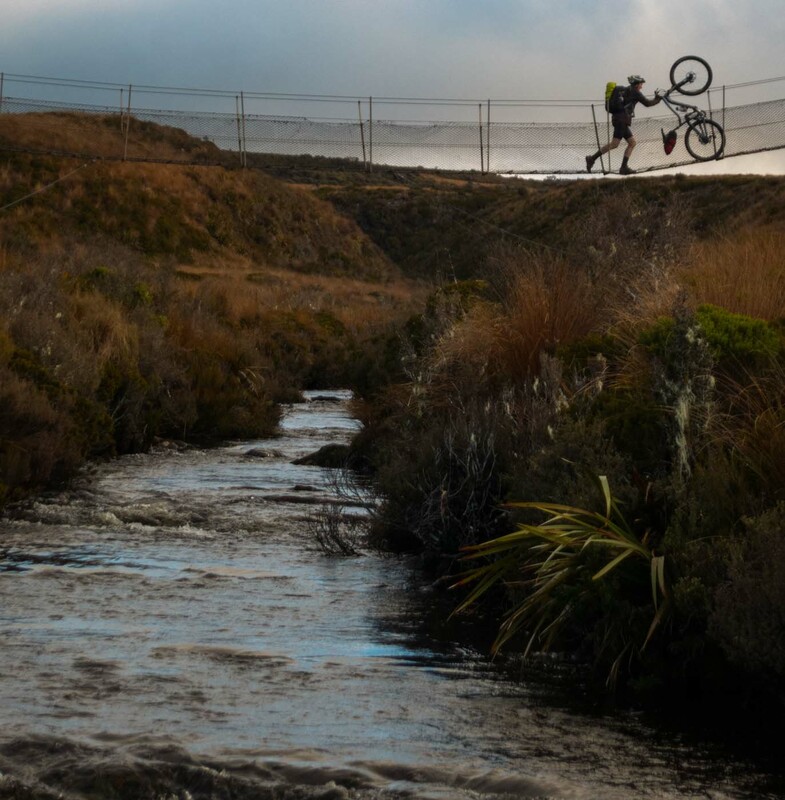 The sinking sun bathed the tussock lands golden as we raced through sinuous single-track, blasted through creek crossings and vanished towards a darkening horizon. 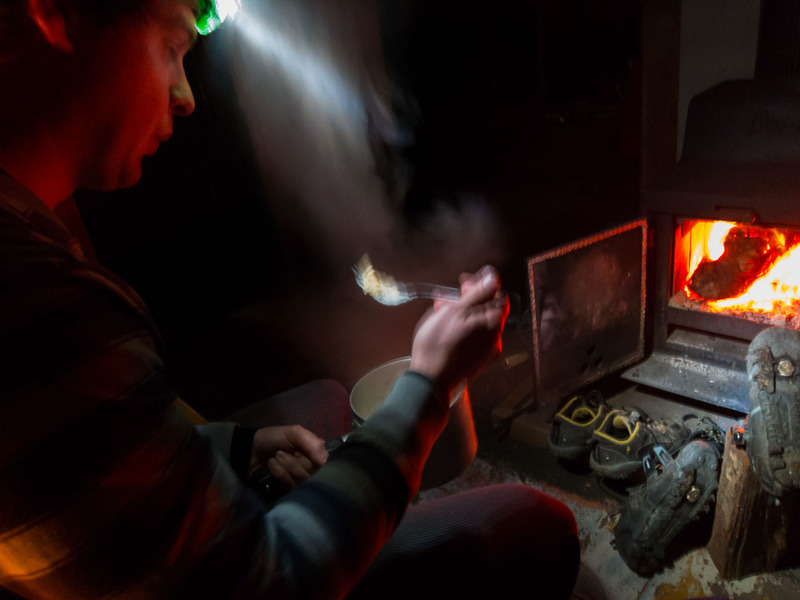 Our sole night on the trail was at Saxon Hut which we pretty much had to ourselves (thumbs up for winter). Listening for Great Spotted Kiwi on the deck, with a hot cuppa and the Milky Way gleaming above, I thought ‘It doesn’t get much better than this’. Clear skies had given way to a grey and haunting mist for our second day. 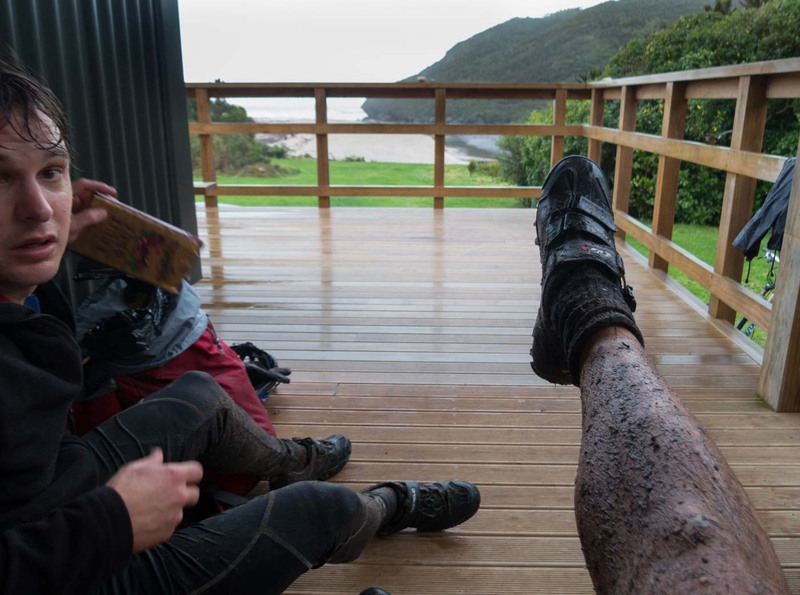 Ahead of us was a 50km undulating descent to the finish at the Kohaihai River mouth on the west coast. The weather may have deteriorated but the mountain biking was getting even better. The sport has brought great income into the region and DOC has responded, ever improving the surface and making it a joy to ride. Having sorted a problematic luggage system, I had now entered the Mountain Bikers Zone, a mindset where all that exists is the trail ahead and trivial distractions melt away. So it was that my memory of the stretch to James Mackay hut is minimal, with only the surety that it was some of the best singletrack I’ve ever weaved a bike through. It felt a privilege to be biking this Great Walk and to be surrounded by such untouched landscape. The rain had set in but we were grinning like loons all the way to the hut. Gnawing on a soggy cracker in the rain, I considered the hiking vs biking experience. The tramper, moving at snail’s pace, surely experiences the land more deeply than those on a bike. But for large doses of adrenaline in paradise, biking’s the way to go. And it was with this thought that we once again pointed our bikes downward, plunging into a 12 km downhill that redefined my idea of an adrenaline fuelled singletrack descent. It twisted and turned, presenting clear stream crossings, semi-cambered corners, bright mossy rocks, and even the odd jump. It poured down all the way but I noticed neither the rain nor the scenery as we barreled towards Heaphy Hut and the coast beyond. 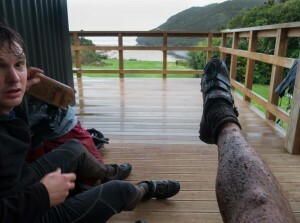 Completely sodden, our lunch at the final hut on the trail was a meagre affair. Even the wekas were disinterested in our food, probably deeming us too bedraggled to have anything of value. We had made good time, but with a preplanned rendezvous at the trails end, we now had an hour to kill. Heaphy Hut enjoys a magnificent location, surrounded by nikau palms, and with a wonderful verandah that overlooks the Heaphy River surging into the Tasman Sea. Not a bad place to kick off the cycling shoes, ditch the bikes and take a stroll along the beach. Back on the trail, the hardpack had given way to sand. 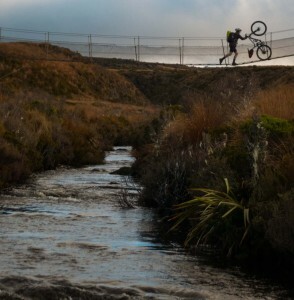 The waves boomed to our right as we toiled amidst the mountain biker’s least-favoured surface. Energy levels, like the rain, were starting to fade. So it was that we welcomed the final climb up to Kohaihai Bluff, pretty much the only ascent since the spin up to Perry Saddle (seemingly) so long ago. The trail concluded with another great downhill and then all of a sudden it was over and our transport was there waiting for us. With high fives all round, we cleaned up and made our way to Karamea. Time to recount our adventures over a west coast pint, some whitebait fritters, and an All Blacks demolition job of the English! The Heaphy is 78km long. Popular opinion is that it’s best to start where we did, at the Golden Bay (Aorere) end. Be well prepared. The area has plenty of rainfall and can experience extremes in weather. But only take what’s needed – the less weight you carry, the better. Don’t expect cellphone coverage on the trail. 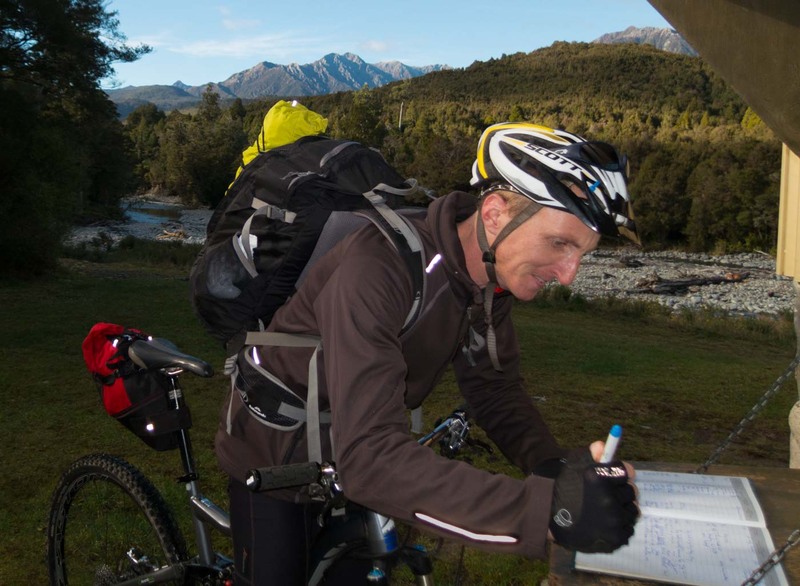 At the conclusion, it’s possible to obtain a signal at Karamea. The stretch between the Heaphy Hut and Kohaihai can be impassable at high water. Check the tides beforehand. Give walkers the right of way, don’t leave any litter and respect the privilege of cycling this amazing trail.